In Familiar Refrain, Syria Faces Criticism, Not Intervention : Parallels The West is facing renewed pressure to take stronger action following claims that the Syrian regime used chemical weapons in an attack on Wednesday. But the U.S. and other Western countries have so far sought to limit their involvement in the Syrian conflict. 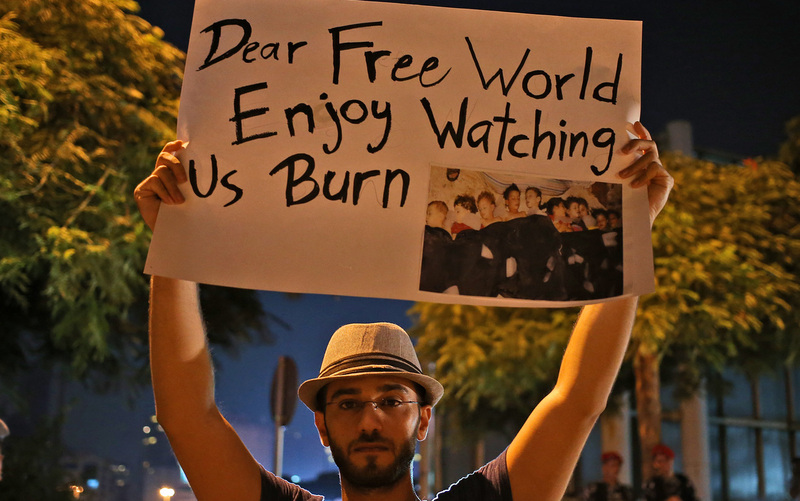 A Syrian man protesting an alleged chemical weapons attack in his homeland holds up a placard Wednesday in front of the United Nations offices in Beirut. The international community once again rose in near unanimity to condemn a mass killing of civilians in Syria. But, as with so many previous episodes, no one proposed concrete action intended to prevent such bloodshed in the future. The White House on Thursday expressed "deep concern" and urged a U.N. investigation into what the Syrian opposition says was a chemical weapons attack near Damascus on Wednesday that left hundreds dead. State Department spokeswoman Jen Psaki said "at this time we are unable to conclusively determine [chemical weapons] use. We are focused on doing everything possible within our power to nail down the facts." The BBC noted that the U.N. Security Council could only agree on a relatiavely mild statement because of opposition from Russia and China, allies of the Syrian government. The Syrian government denies using chemical weapons, and the details are still murky. The U.N., meanwhile, called for a thorough investigation, and as it happens, a U.N. team recently arrived in Syria to investigate previous reports of chemical weapons use. However, it was not clear whether the U.N. team would be allowed to travel to the eastern suburbs of the capital Damascus, where the killings took place. The latest deaths have again raised the question of what additional action, if any, the U.S. and other countries might take in a war that has been raging for more than two years and left an estimated 100,000 dead. Almost exactly a year ago, President Obama said the use of chemical weapons in Syria would constitute crossing a "red line." Then, in June of this year, the U.S. determined that Syria had, in fact, crossed that red line, and it pledged to send military assistance to Syria's rebels. Saudi Arabia and Qatar have also been supplying the rebels. But the rebels remain outgunned and have sought a more robust international response. The French foreign minister said the international community would have to react with "force," but excluded sending troops as an option. It was not clear what he had in mind, though it could potentially refer to air strikes or setting up a no-fly zone. However, the Obama administration and the Pentagon have expressed strong reservations about such steps, and there is no sign any outside country would be willing to send ground troops into Syria. Still, some analysts thought the latest killings could change the equation. "The administration will come under increased ... international pressure but also domestic political pressure, particularly from Republicans and those in favor of intervention" if the allegations are proven, says Stewart M. Patrick, a senior fellow at the Council on Foreign Relations, who has written about the use of chemical weapons. "I think it represents a threshold situation where it's not simply that a red line has been crossed for the United States, it's that the conflict has moved into a new phase," he says. "And in a way it could galvanize international action." Gen. Martin Dempsey, chairman of the Joint Chiefs of Staff, last month outlined possible U.S. steps in Syria. But in a letter this week, he said the use of force by the U.S. "would not be militarily decisive." "In Syria, the main antagonists are both declared enemies of the United States, with Bashar al-Assad and Iran-supported Hezbollah aligning against al-Qaida-linked Islamist militias. Why shouldn't Washington's policy be to allow them to engage each other, thinning the ranks of each? "And by all accounts, the administration and the Pentagon simply don't want to risk the 'blowback' that could occur if the Assad regime collapses and serious weapons fall into the hands of al-Qaida." But, as Patrick of the Council on Foreign Relations says, the latest reports of the use of chemical weapons is "not simply a crossing of a red line, but a trampling of the red line." "Both on WMD grounds and on human protection atrocity grounds, there would be significant pressure for action," he says, "and significant justification for action."